Baby Carrier One is a soft and ergonomic babywearing choice that makes it easy for you to give your baby the important closeness that strengthens your parent-child bond from day one. The flexible fabric lets you both see and feel that you’re carrying your newborn baby in a natural position, with their back in a C curve. Our unique mesh has been specially developed to be extra soft for young babies yet strong enough for daily use. It’s easy and safe for you to switch between several front and back babywearing options. The size, seat area and head support are fully adjustable, which means the baby carrier can be adapted as your newborn grows and their needs change, as well as to fit different babywearers. 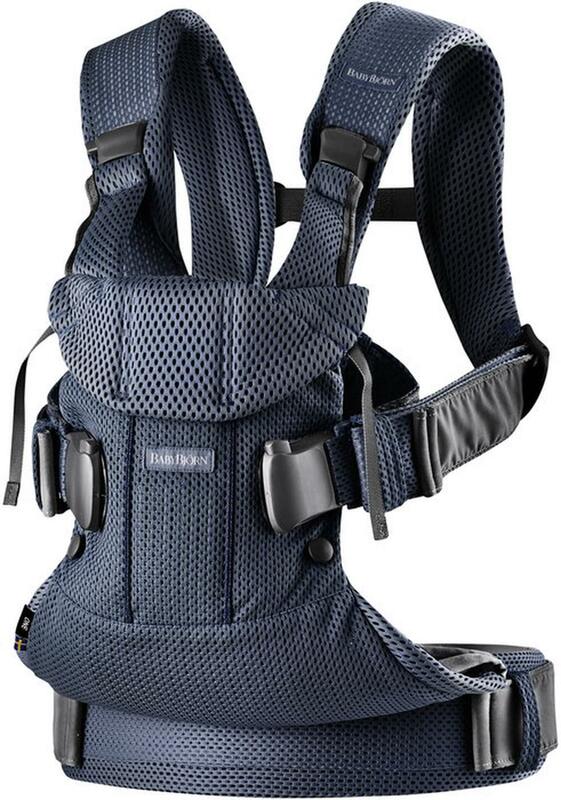 Baby Carrier One Air has a sturdy waist belt and padded shoulder straps that relieve pressure on your back and shoulders, and make it comfortable for you to carry your child from newborn and up to the age of three years. You carry your baby safely and comfortably – while you keep your hands free! The head support protects your newborn baby and gives the correct support until your baby is able to hold their head up unaided. You can also keep the head support unfolded when your baby is older and is resting or sleeping in the baby carrier. You can easily fold it up or down and adjust the firmness of the support it provides. Our unique 3D Mesh has been developed specifically for our baby carriers and is designed to suit young babies. “3D” means that the fabric consists of three layers: a super-soft mesh next to the baby’s skin, a durable, a non-elastic mesh on the outside and a layer of filling in-between. Instead of padding, which can make a baby carrier bulky and too warm, the filling in the middle layer consists of a fine, single-fiber thread that gives the baby carrier the stability of padding, yet ensures a very good air flow, so it stays airy and cool when you’re babywearing. From newborn to approx. 3 years. Min. 3.5 kg/53 cm. Max. 15 kg/100 cm. Please note! When you carry your baby facing out, they should be at least 5 months old and weigh no more than 12 kg. The leg straps should be used to reduce the size of the leg openings for children between 3.5 and 4.5 kg. All materials are kind to your child’s skin and safe to taste. They are free from harmful substances and comply with the requirements of Oeko-Tex Standard 100, Class I for baby products. That’s important to us! 3D Mesh: Main fabric: 100‍% polyester. Waist belt lining: 100% polyester. Leg position zip guard: 100% cotton. Machine wash at 40°C. Wash separately. Use an eco-friendly, mild and bleach-free detergent. Do not tumble dry. Do not iron. Replaced our cheaper brand carrier as we’re going to Europe soon, and wanted something more comfortable. Easy to use and very comfortable. You can tell it’s made well, with quality materials.